Chinese Bridge is an international competition in which non-Chinese students can demonstrate their knowledge of Chinese language and culture… and have a lot of fun in the process! The winners of the national competition get the chance to go to China for the televised finals. Taking part in Chinese Bridge is a great way to develop your language and presentation skills, and really helps you to take your Chinese to the next level. Take part in the Chinese Bridge Competition! Each year, the Business Confucius Institute and East Asian Studies Department select up to four students to represent the University of Leeds at the UK finals in London. The candidates selected receive coaching and support from BCI and EAST staff to help prepare them for the competition. This includes assistance in selecting and preparing an appropriate talent performance. The top UK competitor from the national finals then goes to China for the televised international competition! I think that the best think about taking part in the competition was the incredible help and support given by our teachers at the Confucius Institute and in the East Asian Studies Department. 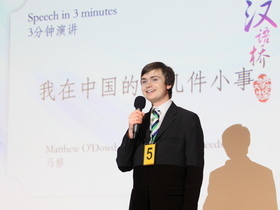 The Grand Prize winner and the First Prize winner will go to China to represent the UK in the Semi-final of the world-wide competition. The cash awards are for the purchase of Chinese study materials. Please complete the form below to register your interest in the Chinese Bridge Competition. If you already know what kind of performance you would choose, or would like to ask for some guidance, please give some details here. If at any time you want to stop receiving information please contact us (confucius@leeds.ac.uk) or click on the unsubscribe link in any email. For more information please see our privacy statement.